Disclaimer: Jeremy Monken is a former employee of Electronic Arts who was kind enough to share with us his story of working at Mythic Entertainment during the final days leading up to the launch of Warhammer Online: Age of Reckoning. As a former employee of EA, he is not at liberty to discuss any proprietary technology or internal conversations. The information presented in this article is his opinion, or was taken from news sources external to EA, or was made public by Mythic Entertainment or Electronic Arts. It is also one hell of a story. - Ed. It all started, as so many things do these days, with an email. I was a game reviewer for a D.C. newspaper, so my inbox was usually filled with press releases, industry announcements and other gaming news. One morning in October 2006 a message caught my eye: "Check out the studio as we celebrate 100 days of EA Mythic." I didn't need much convincing. A few days later, I spent an afternoon at the Fairfax, VA, developer to see what they were up to. They showed me around, showered me with swag and treated me and a few other gaming journalists to an interactive demo of their latest project, Warhammer Online: Age of Reckoning. As we toured the studio, we walked past the customer service room. Before me were desks strewn with toys and fake weapons, rows of computer monitors with eclectic backgrounds and charismatic Gen Y nerds toiling in active digital worlds. It seemed like a fascinating work environment and somewhere I would fit in. 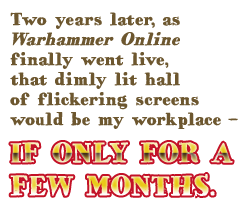 Two years later, as Warhammer Online finally went live, that dimly lit hall of flickering screens would be my workplace - if only for a few months. In 2008, after almost four years reviewing games and covering industry news and events, I lost my job. In my search for new work, I came across a posting for QA/customer service jobs at Mythic Entertainment for Warhammer Online: Age of Reckoning. I didn't have much of a technical background aside from being a lifelong gamer, but I had a few years of customer service experience, so I shot them a resume. I heard back a month later and started at Mythic a week after that. I initially thought it might be some type of call center job, but my supervisors explained that I would be working within the game itself. The journalist in me thought it would be a fascinating look behind the curtain at a young MMOG. The gamer in me thought it would be awesome to finally have the powers of a GM. I would be like an agent in The Matrix.